I joined Forensics in September 2005 after a short secondment. Whilst I was there I was trained in Disaster Victim Identification (DVI) by Tania Curtis and Deena White. This work was very interesting. It was always a challenge but so worthwhile. The work involved long hours – it was usually dirty, required attention to detail and lots of accurate information recording. It is good to know you are helping families in what are usually horrendous circumstances for them. After being trained and involved in some DVI incidents in Tasmania I was privileged enough to be deployed to Victoria in 2009 for the Black Saturday Bushfires. I spent most of my time on this deployment at Marysville, completing Phase One tasks. We attended numerous addresses and located many body parts, however one strong memory is locating two bodies that had been missing since we had arrived. The couple had driven down a gravel track, probably in an attempt to escape the fire, but they had found themselves surrounded and unable to get out. They had left their vehicle and had attempted to run – it was rewarding to have located these people and be able to record the scene to enable answers to be provided to their loved ones. In 2011, I was then blessed with a deployment to New Zealand for the Christchurch earthquakes. My role in this deployment was also DVI but required my time to be spent in the mortuary. This was an open aired shed area – it was set up really well and the process ran very smoothly. My role within the mortuary was mainly accepting the bodies and body parts that came in as a number and then releasing them to the funeral directors with a name. This was a rewarding experience. A fond memory from New Zealand was how respectful the process was – every body or body part was blessed by a pastor in the presence of the team I was in before going to the next area in the identification process. I have loved being part of the DVI group – it is so much bigger than just Tasmania. It is an interesting and rewarding role and one that has made me some lovely friends and wonderful memories. On 12 October 2002, two bombs were detonated in Kuta Beach, Bali, killing 202 people including 88 Australians. The officers worked with other Australian and international agencies to assist in the Indonesian National Police investigation. They received the AFP Operations Medal. The women in the contingent: Constable Tania Curtis, Pam Scott (FSST), Dr Marie Wilson (FSST), Jane Meares (FSST), Rita Westbury (FSST) and Louise Wynen (FSST). On the morning of Sunday 26 December 2004, a severe earthquake occurred in the ocean off the coast of northern Sumatra, resulting in tsunamis that devastated communities in neighbouring countries. The AFP, in conjunction with state and territory police services, deployed members to Thailand to provide assistance with the Disaster Victim Identification process. They received the AFP Operations Medal. Female officers in the contingent: Senior Constable Deena White and Pam Scott (FSST). Twelve members of Tasmania Police were deployed to Timor Leste between 19 June and 2 October 2006 to restore law and order in Timor Leste in sometimes hostile and dangerous conditions. They received the AFP Operations Medal. One female officer: Senior Constable Ann Marie Pretyman. In 2009, 12 Tasmania Police officers were deployed to Victoria to assist during the devastating bushfires. They were awarded the National Emergency Medal for their significant service in assisting with the identification of victims. There were three women in the contingent: Constable Kyleigh Perkins, Constable Deena White and Constable Katrina Chivers. Under the Regional Assistance Mission to Solomon Islands (RAMSI), officers were involved in capacity building initiatives, training, education and effective policing practices that assisted in re-building community confidence in the local police force. Members of Tasmania Police served in 60-week deployments, the first commencing December 2004 and the second commencing March 2006. A number of the members were in Honiara during the civil unrest in April 2006; Sergeant Whitwam was injured as a result. The officers received the Humanitarian Overseas Service Medal for their services. The women in the contingents included: Then Senior Constable Natasha Freeman, Senior Constable Ann-Marie Pretyman, First Class Constable Jacqueline Rawlings and Sergeant Kerrie Whitwam. Identification (DVI) Team. They received the Humanitarian Overseas Service Medal for their efforts. Sergeant Renee Stewart and Sergeant Lauren Connell were awarded a Citation from the New Zealand Government for their assistance with general duties policing after the Christchurch earthquake, and the Humanitarian Overseas Service Medal. In 2014, the specialist DVI skills of Tasmania Police were again called on. On 17 July, a passenger flight from Amsterdam to Kuala Lumpur was shot down over Ukraine, and 298 passengers and crew were killed. Sergeant Katrina Chivers and First Class Constable Rod Walker travelled to Hilversum, the Netherlands, to assist with the return of victims’ remains to their families. They received the Humanitarian Overseas Service Medal and the Australian Federal Police Operations Medal for their services. In November 2014, 34 Tasmania Police officers under the command of Inspectors Kathy Bennett and Peter Harriss assisted the Queensland Police Service with operations for the G20 Summit. Under the G20 (Safety and Security) Act 2013 officers were provided with special powers to promote the safety and security of persons attending any part of the G20 meeting. The officers were awarded citations for their services in recognition of their professionalism and assistance. Eleven of the 34 officers were women: Inspector Kathy Bennett, Sergeant Brenda Orr, Sergeant Lisa Heazlewood, Sergeant Andrea Richardson, Sergeant Sonja Wilson, Constable Renee Cowen, Constable Teagan Walkley, Constable Alison Kay, Constable Samantha Radford, Constable Claire Leary and Constable Jillinda Mollon. Top left: New Zealand earthquake DVI team. Top middle: Queensland Police Commissioner Ian Stewart with Inspector Peter Harriss and Inspector Kathy Bennett. Top right: The Tasmanian general duties G20 contingent in Brisbane. Above: Sergeant Katrina Chivers was deployed after the Victorian bushfires and to the Netherlands (courtesy of The Advocate Newspaper). 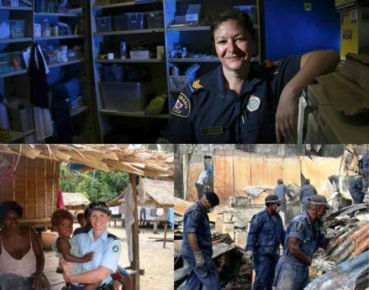 Above left: Then Senior Constable Natasha Freeman on deployment in the Solomon Islands. Above right: Searching the ruins, Honiara, Solomon Islands (courtesy Senior Sergeant Kerrie Whitwam). This page -- https://www.police.tas.gov.au/about-us/100-years-women-policing-tasmania-police/women-specialist-roles/interstate-overseas-deployments/ -- was last published on February 13, 2018 by the Department of Police, Fire and Emergency Management.